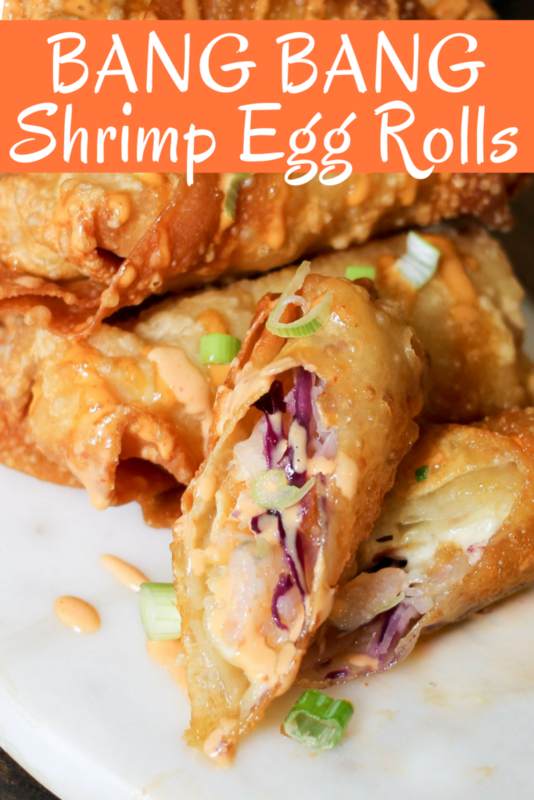 Bang Bang Shrimp Egg Rolls are filled with delicious shrimp, slaw, and the super popular Bang Bang sauce! Perfect game day snack or appetizer! If frying: Pat defrosted shrimp dry. Toss in cornstarch until covered. Heat oil in a shallow skillet, until hot. Carefully cook shrimp in batches until done-do not overcrowd the skillet- then place onto a paper towel lined plate. Cook all. If not frying: run defrosted shrimp under cold water for 5 minutes. Pat dry. Set aside. Add all ingredients into a jar/bowl and stir until combined. Cover and place into fridge until ready to use. Lay out the egg roll wrapper. Add about 2 TBS of cabbage mix to the center, then 2 TBS shrimp, cheese slice, and some sauce. Carefully wrap the egg roll, being careful to keep it tight so the ingredients don't fall out. Dip finger in water, then run it along the final/top corner of the egg roll, and press to seal the wrapper. Repeat for all egg rolls. In a frying skillet/pot, add oil and heat over medium for about 5 minutes - to 325 degrees. 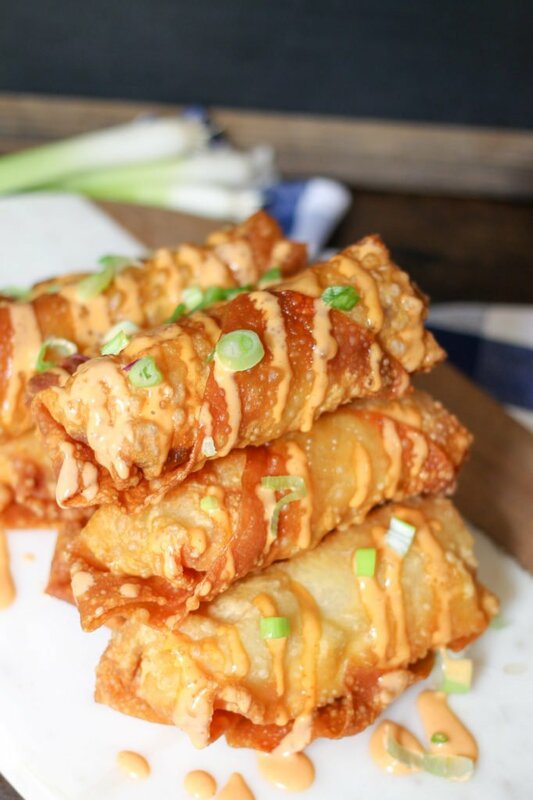 Carefully drop egg rolls into the skillet, cooking 4-5 at a time, not crowding them. Cook 2-3 minutes per side, until golden brown, then carefully flip over and cook another 2 minutes or until browned. Remove and place on a paper towel lined plate. Repeat for all egg rolls. Serve on a platter and top with bang bang sauce and green onions. Serve immediately! 0 Response to "Bang Bang Shrimp Egg Rolls"